This trip, Guy Fieri's cruisin' the islands with his buddy, Chef Reno Henriques, on a culinary tour of Maui, Hawaii. 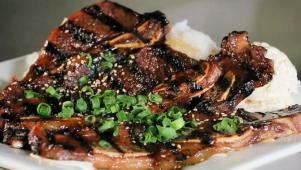 First, a real-deal taste of regional favorites like loco moco and kalbi ribs. Then, a legit barbecue joint smoking up St. Louis-style ribs and the bomb burnt ends, and a food truck dishin' out the freshest catch served raw, baked and even deep-fried. Guy learns the secret behind Da Kitchen's "onolicious" short ribs. On his last stop in Maui, Guy encounters a new take on poke bowls.